This third match in the second round of Bracket Five of the Fantastic Reviews Battle of the Books features Nightglass by Liane Merciel against The Devil's Nebula by Eric Brown. The winner will be the book I (Aaron) most want to continue reading after 50 pages. Nightglass: Paizo paperback, July 2012, 345 pages, cover art by Tyler Walpole. Nightlass advanced to the second round with a win over Paradox Resolution by K.A. Bedford. Nightglass is a tie-in to the Pathfinder role-playing game. In the dark realm of Nidal, strange and unfriendly "shadowcallers" come to the home of our young protagonist Isiem, looking for young people with magical abilities. Isiem has no wish to go with them, but is forced to reveal his talents in order to save a friend. The shadowcallers take Isiem to Pangolais, to be trained in a dark type of magic. He proves quite adept, but has little enthusiasm for his new home. 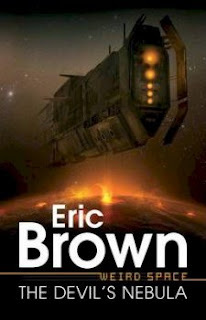 The Devil's Nebula: Abaddon paperback, June 2012, 350 pages, cover art by Adam Tredowski. The Devil's Nebula reached the second round by defeating a "seeded" book, Deadfall Hotel by Steve Rasnic Tem. The Devil's Nebula is the first volume in the Weird Space series. The series is set in the distant future, when humans battle an alien race called the Vetch. The three-person crew of The Paradoxical Poet arrives illegally on the evacuated world of Hesperides, in search of a lost work of art as well as wreckage from a mysterious alien spaceship, only to find a Vetch ship already there. After an initial contact with the Vetch, the commander Ed Carew leads his crew through the alien ship. The first 50 pages end with The Paradoxical Poet being captured by a human patrol vessel. The Battle: The entries in the second round of this Battle of the Books continue to maintain a very high level. 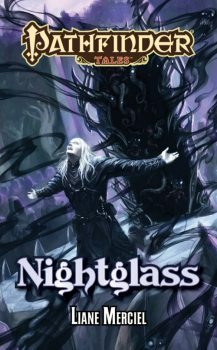 Nightglass gives us imaginative and evocative fantasy, while The Devil's Nebula is good fast-paced space opera. You could hardly go wrong with either one. The ironwork on the pillars held odd, egglike shapes hoisted high above the children's head. They resembled huge maggots, pallid and featureless in their cocoons of bent metal——but as Isiem walked toward the first one, it blinked open eyes he had not known it had. "Ah," the thing croaked in a rusty, gurgling voice. Its face was a soft white sack of flesh, its mouth a wet glimmer between pouches of suet. Yellow sand caked the corners of its pinkish eyes. Caged from the neck down in iron, the creature could not wipe the crusts away. "Young blood. Come, children. Let me taste you." It was a man. Hairless, limbless, locked immobile on a pillar in this seldom-visited section of the Dusk Hall . . . but at one point he had been human, whatever he was now. Isiem held back, too frightened to obey. The other boys quailed with him. Helis, casting an angry look over them all, shoved between them to approach the crippled man. "I'm not afraid of you," she announced, crossing her arms and closing her eyes. "Do it." "A lie," the limbless one replied, his words thick and wet with yearning, "but I will." His tongue rolled out——long, long, infernally long——and engulfed her head in its slimy, blue-veined coils. Helis issued a muffled protest, but the tonge wrapped around her face suppressed it. Eeeeeewwwwwwwwwwww! And I mean that in a good way. The Devil's Nebula has also started well, with our main characters exploring an enigmatic alien ship, which suggests there is more at play in this future galaxy than they realized. However, although I don't have any complaints about The Devil's Nebula, through 50 pages it hasn't offered any passages quite so memorable as some of those in Nightglass. And while the characterization is certainly not bad, the characters are painted with a rather broad brush. Ed Carew is "a loner. He had no emotional attachments of any kind, and no wish to form them." One of his crewmembers, Jed, is found after their encounter with the Vetch "still cowering in the undergrowth." So far I have the sense there is more depth to Isiem and the other characters of Nightglass, and I want to learn more about them. Nightglass advances to the semifinals, to face either A Guile of Dragons by James Enge or The Testament of Jessie Lamb by Jane Rogers.